Some of the more frequent questions coming into our Help Desk (support@getbirdseye.com) are about the audio collections and sound files in BirdsEye. Bird sound files are included for almost all species of North American birds, but generally if you are interested in calls and songs for birds outside of North America the additional purchase of an audio collection is required. Audio collections are a one-time purchase that includes the sound files for the area, plus access to eBird sightings, images and text for the species that are covered in the sound package. An additional membership for the region is not needed. Rather than a separate app these are collections of sound files that are accessed and played using BirdsEye by tapping the sound icon. When purchasing on our website (BirdsEyeBirding.com) there is also an option to buy sound package with mp3 format as well as the BirdsEye extension. This option is for users who want to use sound files with third party sound management applications that can be played on a PC or mobile device outside of BirdsEye. We are excited to work with the fantastic bird recordists at BirdSounds.nl to offer their extensive audio collections through the BirdsEye app. The sounds are accessed within BirdsEye, which you can download for free from the Apple App Store or Google Play. They are available to you when you login BirdsEye with your username (your email address) and password. Just tap the speaker icon next to the bird and all the songs and calls for that bird will be shown. Purchasing sound collections also gives you access to eBird sightings, images and text for the species that are included in the sound package at no additional cost. If you aren’t already using BirdsEye, simply download the free version of BirdsEye from the App Store or Google play and purchase the sound files as an in-app purchase. or at a discount through our website. **register with the same email address you used to make this purchase. Your purchased sound package will be at your fingertips. No additional purchase is necessary. 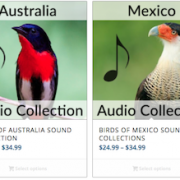 Purchasing an audio collection gives you access to a large library of bird sounds, all within BirdsEye. It also gives you access to the BirdsEye images and text, as well as the eBird data available for the species that are included in the package. You can download a collection to your mobile device for offline use and remove it to free up space as often as you wish. You can access this package on your Apple or Android mobile device, so long as they are all registered to your BirdsEye account. To download all of the sounds for offline use, just go to “Settings” and then choose “Download for Offline”. Enjoy! From the BirdsEye home screen, choose the “Memberships and Audio Guides” (Apple) or “Store – Field Guides and Audio” (Android) option. Scroll to the audio collection for the region you are interested in, select it and follow the prompts to purchase through your iTunes or Google Play accounts. You can also purchase audio collections at a discount from our website: choose the BirdsEye Bird Guide option form the main menu and then select “Audio Collections” from the menu. Next, choose the collection you would like to purchase. After selecting the audio collection, there is a dialog box labeled “How would you like to download and access this sound collection?”. You can choose to access the sound files “through BirdsEye on your phone”, or “As an MP3 download (also includes access through BirdsEye app). The second option includes the audio collection in an mp3 format as well as the BirdsEye extension. This option is for users who want to use sound files with third party sound management applications that can be played on a PC or mobile device outside of BirdsEye. 1) If you don’t already have BirdsEye, download it to your mobile device (for free) from the Apple App Store or Google Play. 2) Register or login to BirdsEye using the same email address you used for your purchase and your sound collections will be immediately available within BirdsEye, just tap the speaker icon for any of the listed species. 3) You can download the sound collection for offline use, or access it via the internet as you need it to save space. It’s up to you. You can clear the sounds from your device and download as many times as you want. Remember, you can focus in on just the birds in a specific sound package or membership group. In the Search by Name section, select the “funnel” icon in the upper right, scroll to the “Bird Sounds of Mexico” or whatever the region, and tap it. That should put you back on the “Search” page with just those birds listed.